Butter the pudding basin. Mix the treacle and the stem ginger syrup together and pour into the bottom of the basin. Cream the butter and sugar together in a bowl or in an electric food mixer until light and fluffy. Beat in the eggs a little at a time. Fold in the flour and add enough milk to give a dropping consistency. Stir in the stem ginger and spoon the mixture into the pudding basin to come two-thirds of the way up, smoothing the top with the back of the spoon. The treacle will come up the inside of the basin, so be careful not to mix it into the cake mixture. Butter a piece of greaseproof paper and fold a pleat across the centre. Cover the basin with the paper, butter side down, and secure with string under the lip of the basin. Place in a steamer with a tight-fitting lid and simmer on a low heat for 1¼ to 1½ hours or until the top of the pudding is firm to the touch and a skewer inserted into the middle becomes out clean. Remember to top up the water if necessary. Alternatively, if you don’t have a steamer, sit the pudding basin on an upturned saucer in the bottom of a large saucepan. Pour enough boiling water to come halfway up the sides of the basin and cover with a tight-fitting lid, then cook for the same length of time. Again, remember to keep the water topped up all the time. Remove from the steamer or pan, carefully loosen the pudding by running a spatula around the inside of the basin and invert onto a warm serving plate (one that is wider than the top of the basin). 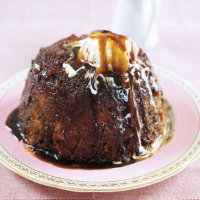 The treacle sauce will ooze down the sides of the pudding. Spoon over any sauce remaining in the basin and serve with ice-cream, softly whipped cream, or custard.